Sea joins the pure and deep blue sky; a sea without any end or beginning draws the horizon line over the hill of the dreams. 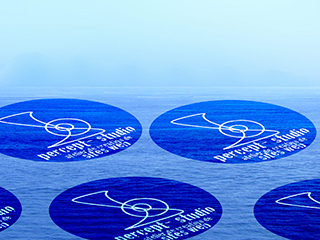 Percept-studio’s logo lands over the waves. The wall, that hides and let imagine its back beyond the posters, is actually devised into many blocks flying in the hot atmosphere of summer. Any move seems to be stopped in a heavy fog. Neither the sea nor the blocks suspended over percept-studio’s logo are moving. Just the time is animated, just the months and the years composing the chronicles’ table of contents. all these solid blocks could fly and sometime find an invisible axe to rotate around. With a 3D particle system, that dream of summer becomes possible and that extraordinary phenomenon appears on our chronicle of august.